Today I've got an whole collection of polishes for you, the Sun Delicious Limited Edtion from Essence which came out this month. First off, my little rant about the recent "LE Spam" from Essence. They releassed about 8 Limited Editions in the past 3months (including June/July). Even tough I live in the capital city, it was more than tiring and exhausting to hunt after the things you want to see in person before buying it. My favourite drugstore even hasn't got any room left for new displays because of this dilema. I hope it'll get better in the next few months. So Essence, if you read this, please stop throwing your Limited Editions at us- or as we would say in German: "Qualität vor Quantität" (Quality, not quantity) . 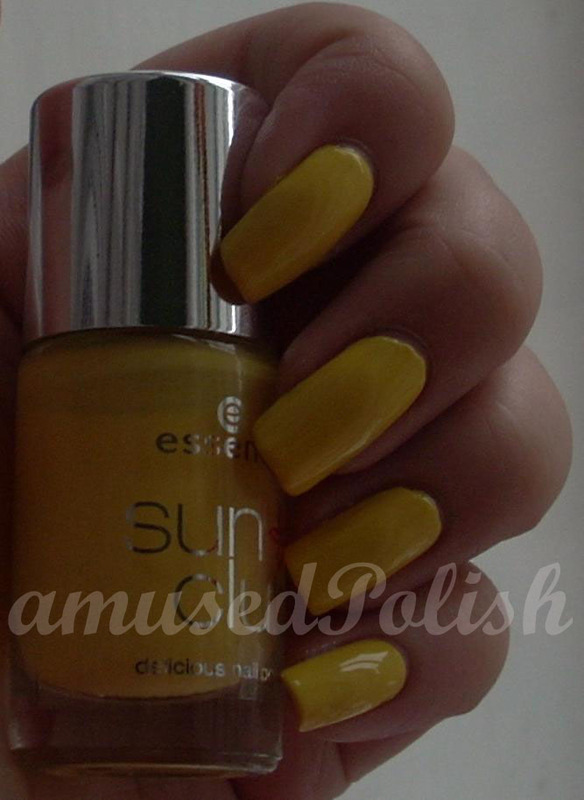 Sunny Side Up is a yellow creme. It really has the color of yolk and applied well. I used 3 coats to even out the little bald spots. Chocolicious is, as the name implieds, a chocolate brown. It doesn't have a shimmer and was quite glossy. 2 coats to reach opacity. Raspberry Sorbet is a berry-magenta color. It's a creme and applied nicely with two coats. 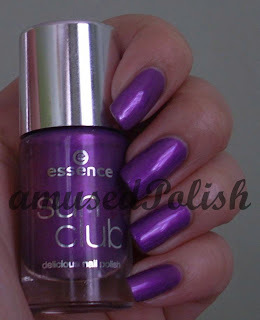 Meet me at the club is a middle toned purple, leaning more to to the magenta-color. It has a copper,-gold-ish shimmer and needed 2 coats to be opaque, however, the shimmer doesn't transfer to the nail. 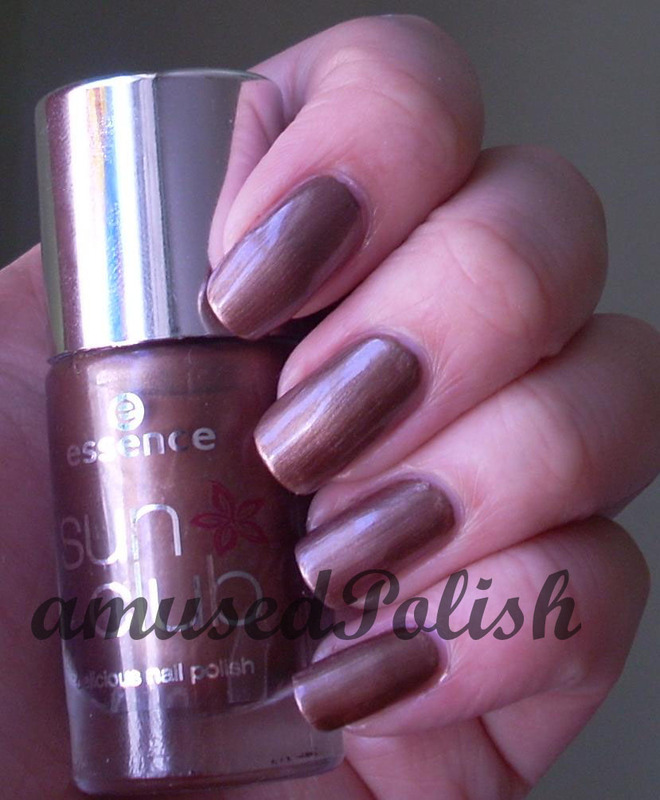 On Holiday... is a dark copper-brown with a really light foil finish. 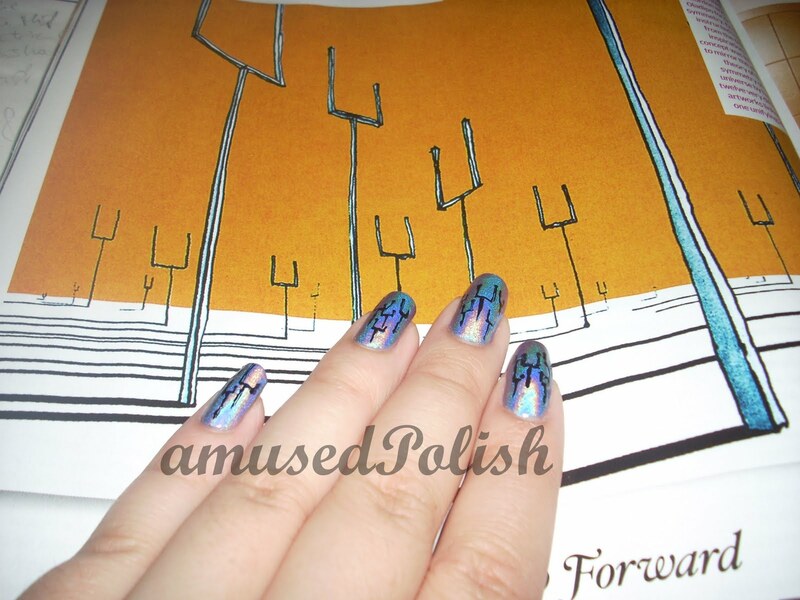 It's a bit hard to describe, it may be a half foil, half shimmer polish. This was my least favourite because even after the third coat you can see the brush strokes. I used 3 coats here. Overall, I don't think some shades here are unique. You can even live without them, even without the purple one (and I'm a sucker for purples). One of the things that's nice about them, is that they have a pleasant smell. My favourites are Meet me at the Club and Sunny Side Up. 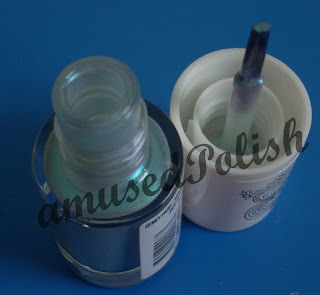 The Luminelle polish is from Yves Rocher and holds only 3 ml, which is one of my first complaints: a 3ml bottle? I know the chances are really high to use up this bottle but you can see in the pic that Orly's bottle looks like a giant compared to it. The other thing is, that the handle and the brush are tiny too, which makes the application difficult- no matter how long/short your nails are. I thought that the base color of these two polishes was the same but it isn't- the Luminelle one is a bit more blue and has a pink/magenta shimmer, whereas Fantasea is more red-toned with a gold shimmer. If you click on the picture, you'll see a bit of gold shimmer in MC, but it doesn't show on the swatches. The consistency of both was ok- I think I'll decant the Luminelle one into another bottle because it's bugging me. I used 4 coats each and both seem perfect for layering. 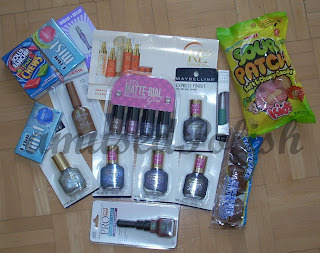 Also I wrote the order on which I applied them on the picture. My conclusion: I like both but Mauve captivant a bit more but I hope I can buy a backup bottle of it, because the chances are high (even for an addict like me) that you'll really use up a bottle of it ^^. 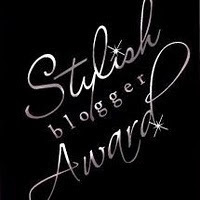 The lovely jbroback from polish insomniac gave me this award- thank you sweetie! 2. I also love earrings. Even tough I don't change them every day, I love buying them or diy-ing. 3. I don't like apple/mac things- they are mostly overpriced. The Ipad/Iphone might be a great gadget but I don't want one and I dislike Itunes. 5. I love travelling. I have relatives all over the world which makes it easier (and a bit cheaper because you don't have to pay for a hotel). 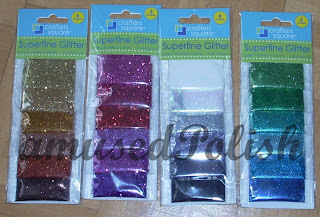 When I did these swatches, one thought crossed my mind: layering. And I finally had some time to do a layering swatch with it. 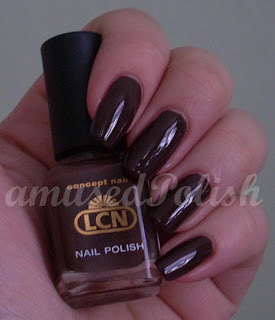 I used one coat of Wet'n'Wild Black Creme and one coat of LCN 43179-21. 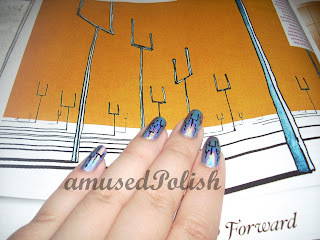 The result is mesmerizing, I've never seen a polish like this before and I'd definitly wear this one as a manicure. Sadly, the pictures didn't capture the depth- it looks so much better in person and it is still really glossy- even without a topcoat. My index and middle finger shows the effect best. There's a polish in this posts which was sent to me to review, please visit my Disclosure Policy for more details. 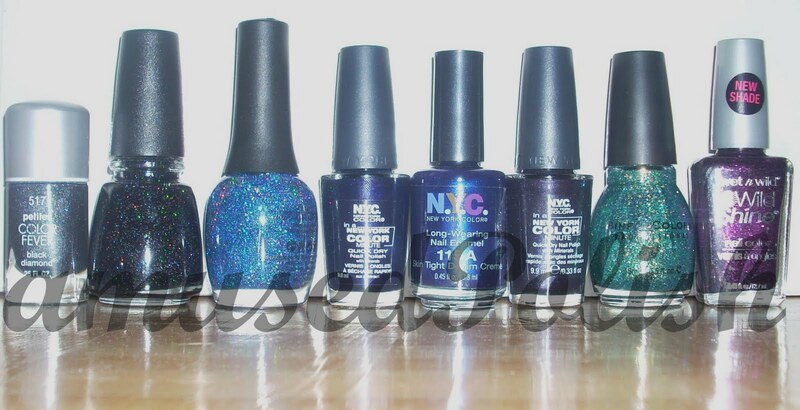 Wow, I really love every single polish and can't wait to wear them- a huge THANK YOU to all of you, I really love and appreciate your generosity and can't thank you enough for fulfilling my lemmings and making my wishlist shorter. Just a quick post for today because I've got two exams (finals)- one on Saturday and one on Monday- which means a lot of studying and fewer posts from me. I also won't post much in the next 2 weeks because after that I've got a few other finals the last week of June. But I've planned something on the first week of July, so that's something you can look forward to ^^. I've layered the infamous Hidden Treasure over my Twinkle Twinkle manicure and was a bit dissapointed that the glitter from TT wasn't visible anymore but decided that I'd leave an accent finger so I can still admire Twinkle Twinkle on its own. The removal wasn't bad either (of both polishes) I expected it to be much harder but it was quite easy to remove. The opacity was goot to, it needed 2 coats to be opaque and I love it. There's silver glitter in it and at some angles there are a few glitter-particals that are visible inder a real thin coat of polish- a glow-look. 8. What foods do you dislike? or rather don't prefer? People who walk slow when I'm in a hurry. It drives me nuts. 48. What do you like to do when nobody else is around? I used 3 coats on both. See? Cotton Candy is more pink than FD. French Deluxe is a pastel peach- and I think both would go on well for a french or american manicure. CC took 3 coats to be opaque and FD 4 coats. There is also a hint of gold shimmer in the bottle of Cotton Candy which sadly didn't translate to the nail. I used two coats each. I'd call it a tie between Gum Drop and Fleur d'amour- both are great and whereas Gum Drop has got its unique scent, Fd'a has the glossiness. Cotton Candy would win the second battle because my yellow-ish skintone looks more yellow when I put French Deluxe on. And grape Icy wins the 3rd battle. 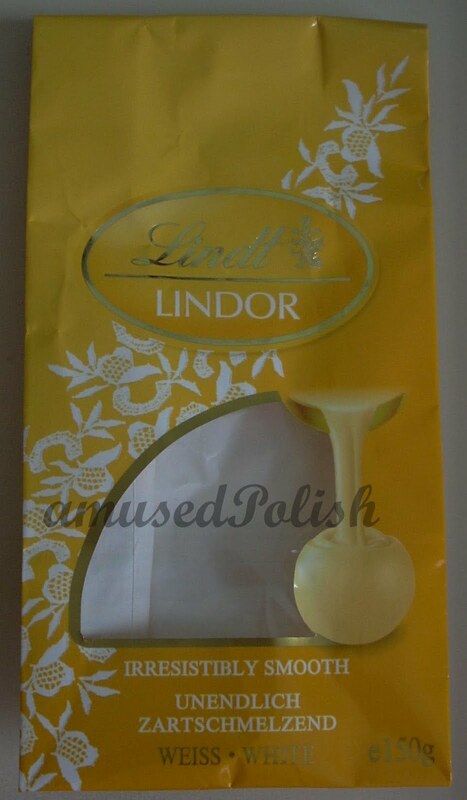 It smells nice and has a great shimmer in it. 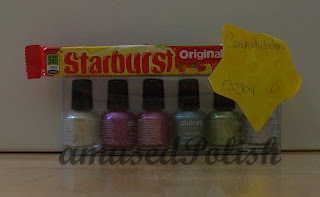 There are polishes in this post who were kindly sent to me for reviewing purposes, please visit my disclosure policy for more details. 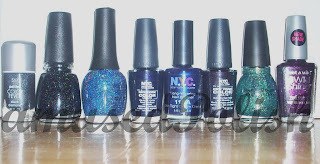 Today I'm reviewing some LCN polishes which I got some time ago. LCN is a German company known for its nail/ nail design products. 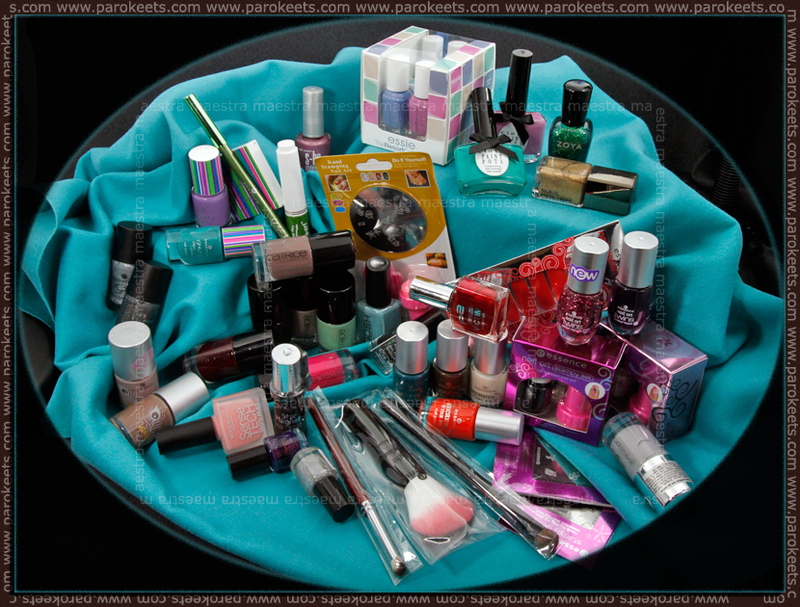 They've got quite a wide selection of polishes, acrylics, gel nails and even make-up. The drying time was great too- by the time I finished painting my pinkie, I was able to paint another layer of polish with no waiting time inbetween (except the first one). 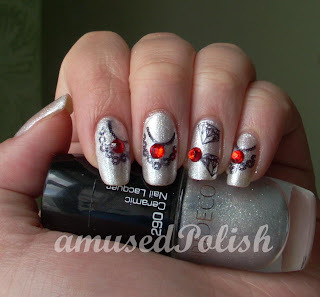 above and below: Doesn't this polish scream mannequin hands? The glossiness of French Deluxe- as the name impliedes, it is made for a french manicure, it took me 4 coats to reach the full opacity. above: Tropical Tulip from their Exotica Collection. 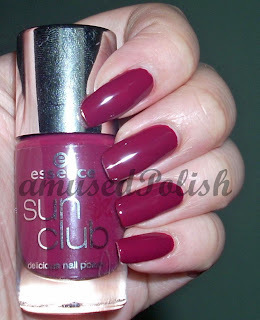 It was opaque in 2 coats and is a lovely mauve-berry color with a creme finish. below: Carribean red- wow, it is my favourite of all, a almost-neon tomato red with a creme finish. The pictures show 3 coats. This one's also from their Exotica Collection. 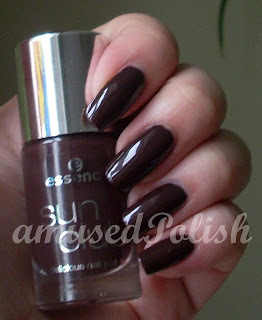 Overall I'm really impressed by the quality of these polishes. They are glossy as hell withouth a topcoat and the non-sheer ones covered nicely in 2-4 coats. All bottles hold 8 ml polish. I'd definitly buy one or two of these shades when I come across them. Next up: some comparisons with those colors. 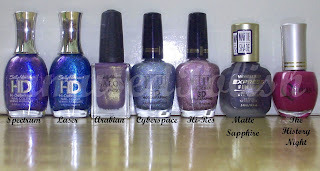 These polishes were kindly sent to me for reviewing purposes, please visit my disclosure policy for more details. Some of you might know that I'm a huge fan of the band Muse. I've been a fan of them for a couple of years now (before the Twilight-hype) and today's the frontmans birthday and I decided to do a little inspired manicure in honor of his birthday. 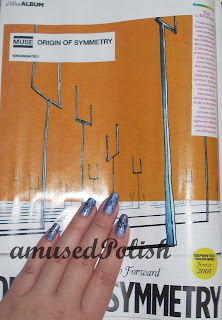 As an inspiration I used the cover of their second album, Origin of Symmetry. The background is a page of NME's special issue- dedicated to Muse in over 100 pages. Here it is- my unnamed franken (if you have any name suggestions, leave them in the comments below :) ) and the matching purse I posted about here.The recipe for this franken was really simple- I used Wet'n'Wild Black creme, a few drops of clear polish and B.pretty in Silver Stars (2 of my favourite polishes to franken with). I think any other silver/holographic glitter would be perfect (I think the Covergirl in City Lights or China Glaze's Wireless Holographic Topcoat/Fiary Dust or Wet'n'Wild's Kaleidoscope for those who like it chunkier ;) ).